Dessert without cheese is like a beauty with only one eye. My husband and I were recently invited to dinner at friend’s house. My friend D., a Cuban-American, made wonderful guava pastries, also known as pastelitos de guayaba, for dessert. My husband and I enjoyed them so much that I had to make them at home and share them with you. I later found out that Brazilians make a similar pastry that they call Romeo and Juliet. I initially featured them in my recent post Love, Happiness, and Romeo and Juliet. Since that post I received several comments and questions regarding the technique I used to make the pastry. So, I decided to make them again—to my husband’s great pleasure—and take photos with step-by-step instructions. When I first had these delicious pastries, they were made into squares (see photos at the end of post). 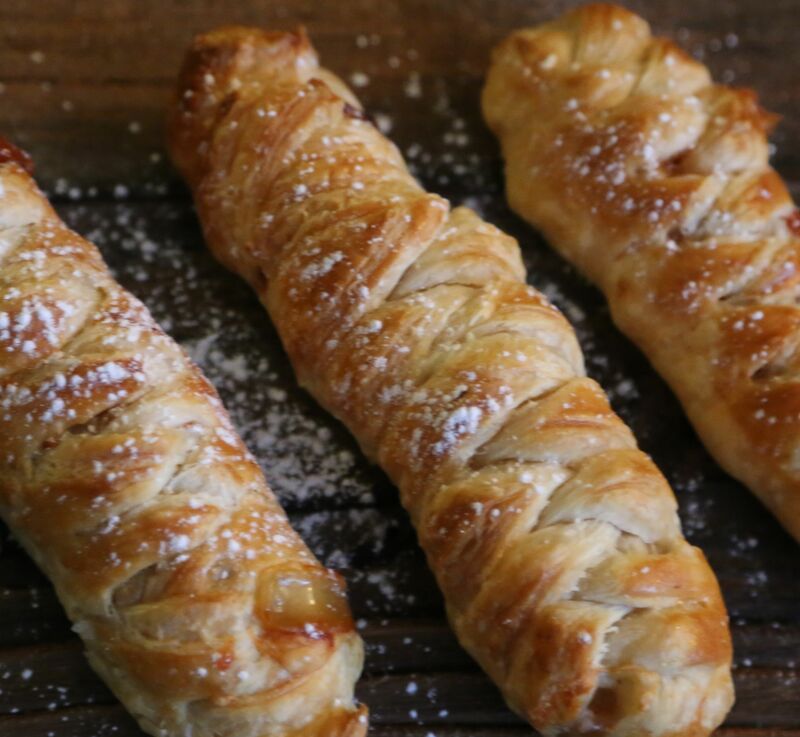 When I told my friend from Norway about this dessert, she taught me how to braid the pastry like a Danish pastry. It’s actually not difficult and definitely worth the extra effort. I love the look as the braiding adds an artistic element. 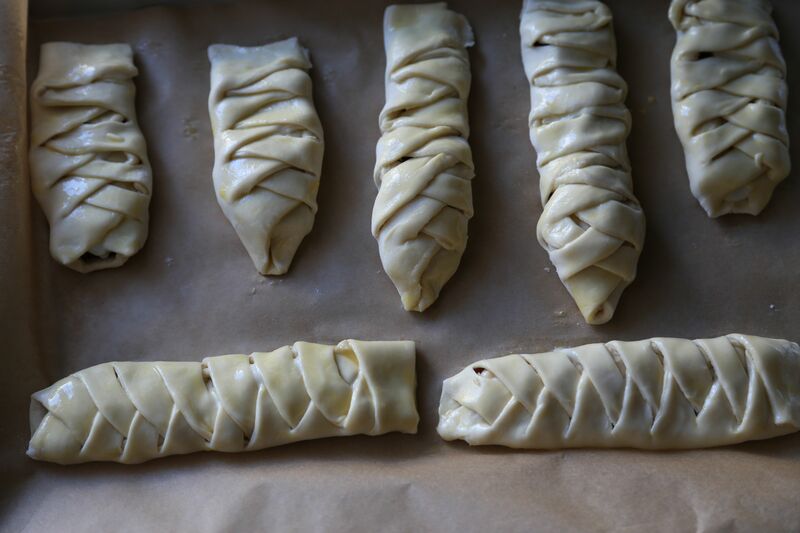 If you’ve ever worked with puff pastry, you’ll know that the faster you work, the better. Otherwise, the butter in the dough melts and you can quickly have a sticky mess on your hands. I knew I would be working more slowly than usual because I was going to take photos in between steps, so I decided not to preheat my oven. It would have made my small kitchen too warm. I don’t get much natural light in my kitchen and since I don’t use a flash, the lighting is a bit darker than I would have liked. However, I believe the photos should help give you a pretty good idea of how the pastelitos are made. 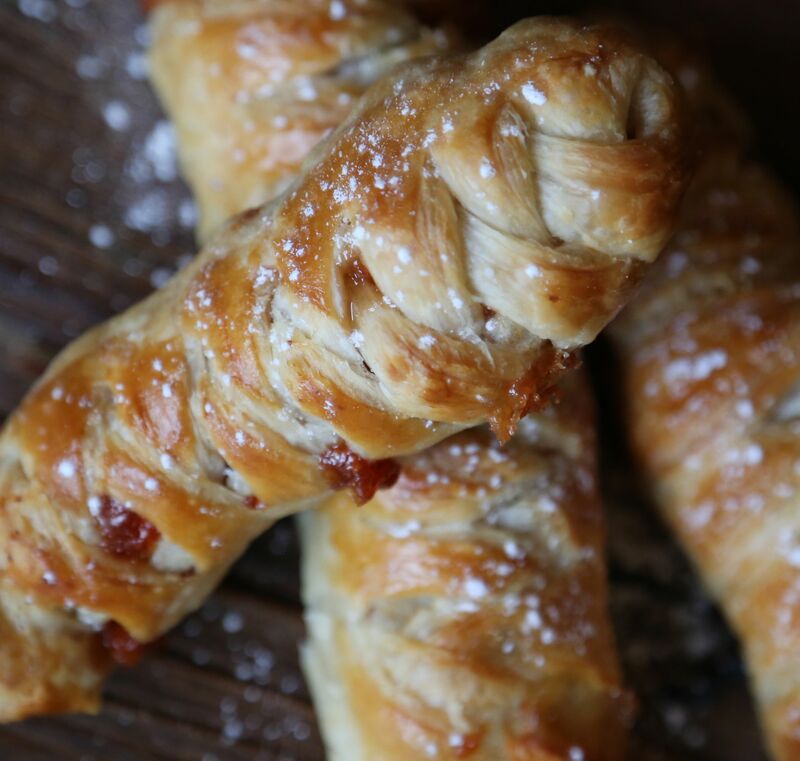 *Use the best quality puff pastry you can find as it makes a big difference. The brand I use is Dufour. Working quickly, roll out puff pastry dough onto a lightly floured work surface. Using a sharp knife, or pizza cutter, cut pastry into rectangles (the size/length depends on how long or large you want each pastry). For each rectangle, cut an equal number of horizontal strips along each side, leaving about 1½-inch of space in between for your filling. Here, I’ve slightly angled my strips. The first time I made them they were horizontal. I don’t think it makes too much of a difference. Place guava paste in the center of the dough. Then, lay a little cheese on top of the paste. I used a ratio of about 1/3 amount of cheese to the guava paste so the cheese would not overpower the taste of the guava. Here, I’ve used a very soft goat cheese, other times I’ve made I used a firmer texture of goat cheese, and other times I’ve used cream cheese. All are quite acceptable and tasty as you can use any type of soft cheese, preferably one that will melt nicely. 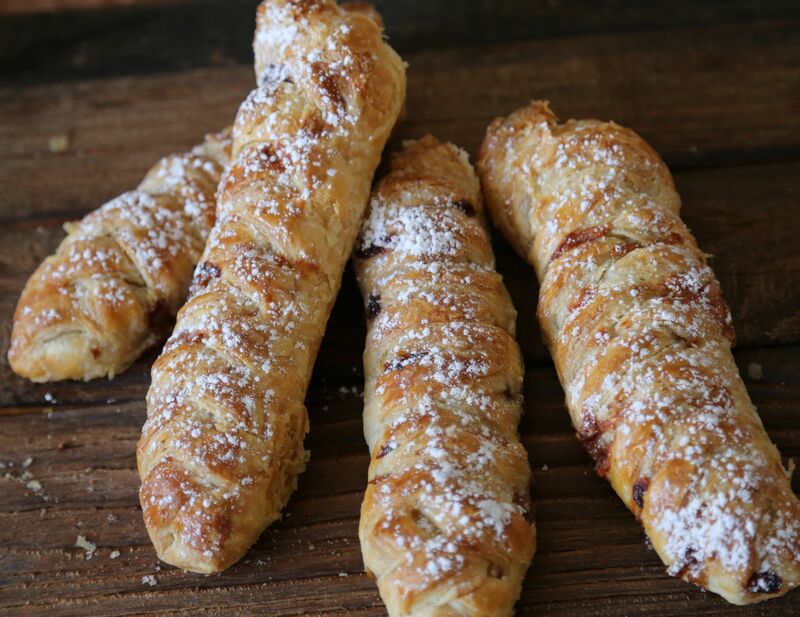 One day I might try these pastries with brie. Alternatively, you don’t have to use any cheese. Start “braiding” the dough. Alternating strips of dough from each side, lightly pull and cross one strip over the center of the pastry, then pull and cross the strip from the other side over top the strip that had already crossed. Continue this technique until you get to the bottom. Be sure each strip is tucked under the strip that covers it. Try to braid your dough for a snug fit, but don’t worry if your braid is not perfectly tight. It’s okay if a little bit of cheese or guava paste oozes out while baking. It may even help to make the pastries look more mouth watering. When you reach the bottom of your braid, seal the dough with a little egg wash or just plain water. Before baking, apply egg wash with a brush on the top of pastry. This will help give it a nice golden color. Then bake until golden brown, about 20 minutes. Remove from oven, allow to cool on a wire rack, about 5 minutes. Dust with confectioner’s sugar. Enjoy! I think they taste best when they’re still warm, yet cool enough to be eaten safely—without getting burned. Below is a gallery of photos of guava pastries I’ve made recently. You will see that they are quite versatile. You can make them long or short, fat or skinny, braided or not. Have fun with them and enjoy! I’ve also made these pastelitos with membrillo (quince paste). They were also very tasty and delicious. I’m sure almost any fruit paste of your liking will do. It’s also very common to use cream cheese instead of goat cheese. I have not tried it yet, but think mascarpone cheese would also be great with guava paste. Experiment and have fun with your variations! Also, you don’t have to braid them and can make them into a squares. To do so, cut out an even number of squares of puff pastry dough of the same size. Place guava paste and cheese in the center of one square. Apply water or egg wash along a 1/4-inch from the edges on each side. Then place another square of puff pastry of equal size on top, remove any air pockets and seal edges. You can also use a fork to ensure the edges are sealed and no filling will come out. The same instructions apply for other shapes you may choose to make. I hope these instructions help. If you have any questions, please don’t hesitate to let me know. I hope you have as much fun as I have making pastelitos de guayaba! All your pictures look delish, especially the one with baby fingers 😊. We used to live 1 block from a Cuban bakery and the guava y queso pastelito is my favorite. Thanks! And so cool you lived so close to a Cuban bakery! Yum! Do you know what kind of cheese they used in their guava y queso pastelitos? I adore cheese for dessert… particularly Brillat-Savarin! 🙂 What type of chevré did you use in this pastry? The step by step photos are gorgeous and so helpful. I will absolutely make this recipe. It would work well with any sweet fruit spread, such as membrillo or even Scottish ginger jam. Lovely, Martine – thank you for the informative photos, too! Hi Shanna, unfortunately I don’t recall the exact type of goat cheese. In the past month I’ve made these pastelitos several times (at least five!) and each time I used a different type of goat cheese. Any should do. Also, like you said, you could make these with other fruit pastes. Apricot sounds like it would by yummy! I also made them with membrillo. I think I mentioned it on the Valentine’s Day post but forgot to mention it here. Will do! So glad the step-by-step instructions and photos are helpful. I’m sure you’ll enjoy making these! Muy buena receta, felicidades por tu blog.Es muy bueno y muy interesante. Muchas gracias!!! Me encanto que te gusta mi blog. Saludos. Martine, love the pictures by pictures instructions! Your recipes look so complicated and fancy but with pictures, it seems much doable to try:) Keep posting and keep taking those pictures! Btw, where do you find the time??? ?